In a recent blog post Salesforce for Apple Watch was introduced. Salesforce Analytics Cloud was launched at the Dreamforce 2014 event, and now it’s available for Apple Watch, together with Salesforce1 for Apple Watch and Salesforce Wear Developer Pack for Apple Watch. Salesforce Analytics Cloud is meant to be analytics ‘for the rest of us’. It’s available in the iTunes App Store. Analytics Cloud can leverage data from a wide range of sources—not just Salesforce—and presents it all in a visually compelling, intuitive mobile interface. The app is free with a paid license of Analytics Cloud and is expected to be generally available in April 2015. Next to Analytics Cloud, Salesforce1 for Apple Watch is meant to deliver instant personal notifications. People in departments like sales, service agents, marketers and more will benefit from this, keeping them connected to the business priorities that matter most. Think of alerts that need or deserve quick responses, like discount requests for sales or when a marketing campaign has surpassed its goal. Salesforce1 for Apple Watch notifications are expected to be generally available the third quarter of this year. 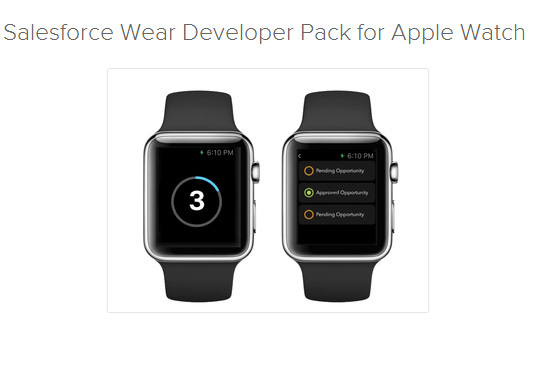 Lastly, to complete the Salesforce for Apple Watch package, there’s the Salesforce wear Developer Pack. The developer pack is open-source, and is meant for Salesforce1 developers to build enterprise apps that connect directly to the Salesforce1 Platform. Wear for Apple Watch allows developers to focus on the most important element of building an app for a wearable – the user experience. They will still have the identity, security and other shared services of the Salesforce1 Platform from the first line of code. The Salesforce Wear Developer Pack provides implementations and typical patterns for enterprise authentication, Salesforce API notifications, and working with Salesforce Mobile SDK response objects. The introduction of Salesforce for Apple Watch just goes to show that the wearable device that Apple Watch is should not be considered something just for consumers. Businesses around the world can benefit from its ‘always on’ and quick notifications in their corporate processes. For full details, visit the Salesforce website.